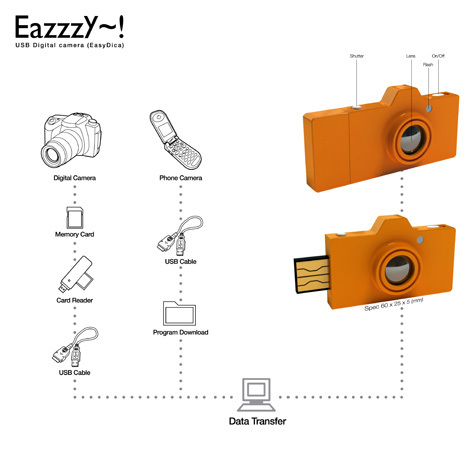 USB Camera Is A Little Too Simplistic | OhGizmo! I don’t really have any issues downloading pictures from my digital camera to my computer. Mostly because I just pop out the SD card and insert it into the card reader in my PC. It eliminates the need for any resource-hogging software. The same goes for my camera phone, there’s just the extra step of inserting the microSD card adapter. Apparently some people still think this is an issue, which is one of the reasons why this tiny USB digital camera was created. I’m going to guess that there’s some artistic reasoning behind this creation as well. You’ll notice that this thing is tiny, which gives no room for any kind of viewfinder or LCD display. You’re kind of in the dark as to whether your picture is going to turn out. I guess I don’t really get it, as I want to make sure that my pictures are actually going be worth looking at when I download them. I’ve also got a beef with their little diagram. They clearly show a card reader that plugs into a USB port, then they show that you need a USB extension cable. Why do they think you’ll need one for that and not your little camera? Because it makes their little camera look better, that’s why. Yes, I am probably reading into it just a little much. The camera does seem more like a toy than a quality camera, but I like the USB connection. That being said, this particular camera does nothing for me. I want to see what I’m photographing and I want to be able to make at least basic settings.